To find out what the Elgin Marbles are we have to first examine ancient history. The ‘cradle of the western world’ is a saying used to describe Ancient Greece. For thousands of years many of the things we do and say today have its origins back to Greek law, art, literature, and political thought. In architecture, for example, many major cities today have a building that is due in large part to the designs used in Ancient Greece; some examples in Washington D.C. are: the Lincoln Memorial, the White House, the Capitol building, and the DAR Constitution Hall—they are all influenced by a great building called The Parthenon. And while it is not one of the “Seven Wonders of the Ancient World," one of its sculptors, Phidias, who directed the construction of the Parthenon, also created a wonder called the Statue of Zeus at Olympia—a 43-foot tall rendering of the god Zeus in his temple, using tons of real gold panels laid in ivory over a wood framework. Too bad it is gone now (believed to be destroyed in a fire) but distinct pillars of the Parthenon are still intact! The Parthenon in Acropolis, Athens, may be the finest Greek temple of all. It is a “high city" structure—originally built for defense, it later served as a royal residence, and then as the city’s chief religious precinct. This was the golden age of ancient Greece—an explosion of talent and creativity in art, architecture, and style. For example, the craft of theatre sprang up here with tragic dramas written by Sophocles, Aeschylus, and Euripides; the think tank and fellowship of great philosophers such as, Socrates, Plato and Aristotle took place; scientific inquiry beginning with mathematician, Pythagoras, came to fruition; and the birthplace of Western civilization and democracy began here. In the early fifth century B.C., Greece was invaded by the armies of the Persian Empire and these wars lasted on and off for forty years. The Athenians held them back at the battle of Marathon, and, in a moment of glory, decided to erect a stone temple in honor of Athena. The Parthenon was begun; a sacred enclosure, an homage to the deity Athena Parthenos—who was warrior maiden, the patron goddess and guardian of the Greeks, sculpted by Phidias himself, most renowned of all Greek sculptors. Before the project was finished though, the Persian fleet under the command of their emperor Xerxes dogged Greece yet again. Still, the huge, lumbering Persian ships were no match for the light, ramming Athenian vessels, but, the toll still remained: Athens had been sacked and the Acropolis and its temples looted and burned. A thirty-year oath taken by the Greeks left the temples in ruin, a memorial to the dead—while the Persians continued on in other parts of the world. During this period of time though, Athens became leader of the Delian League and protected other city-states for a fee—a kind of tax—that eventually made for them a surplus of tribute monies. The Delian League slowly morphed into the Athenian Empire. An aristocrat called Pericles, a democratic leader, urged citizens to rebuild the Acropolis and intended it as a public works project. Greek historian Plutarch told stories of the thousands of laborers involved—artisans in carpentry, molders, stonecutters, goldsmiths, ivory workers, painters and many more skilled tradesmen worked—and every trade had its own hired company of journeymen and laborers who were all paid the same wage. But the glory of the Parthenon was seen in its sculptural decoration: carved figures, reliefs of warriors and horses, and an Ionic style frieze, a continuous band of art: 525 feet long, over 3-foot-high, with 7,000 square feet of animated carving. In addition, the triangular spaces in the east and west pediments were filled with twice life-sized magnificent statues: on the east side was depicted the birth of Athena; and an athletic contest between Athena and Poseidon on the west—with more than 20 additional statues in each niche. By 438 B.C., nine years after construction began, Phidias’s new statue of Athena was completed and installed. Nearly forty-foot high, the statue adorned the center of the cella—the body of the temple—and was placed on a pedestal. She wore a long garment with an aegis—a breastplate with the image of Medusa in all her snake-head glory etched in. Athena also sported a triple-crested helmet, and in her right hand, she held winged Victory. The shield nearby was carved with a battle scene (on both sides). And even the edges of her sandals were decorated with men fighting centaurs. Her garments were fashioned from thin plates of hammered gold; her eyes were inlaid with jewels and precious stones used throughout. The sculptural body was ivory and there was more than a ton of gold involved. As one of the world’s greatest cultural monuments of ancient Greece, the Parthenon had its share of destruction and misery throughout its 2,500-year history. The Parthenon thereafter its final presentation, was shot at throughout various wars, the temple was exploded, it was set on fire, shaken by an earthquakes, besieged and looted, and turned into a church. During the 15th century, when Greece was ruled by the Ottoman Empire, whose troops had converted the Acropolis into a garrison, their sultan Mehmed II, had also turned the Parthenon itself into a mosque, complete with a minaret. Later again it was used as a storehouse for gunpowder. And of course, a different skirmish with the Venetians this time caused the Parthenon to be hit by mortar and the explosion decimated the roof! An admiral from Venice, Francesco Morosini, thought it would be a great idea to safeguard the sculptures and tried to move the massive marble statues back to his homeland when the pulley lift broke and many sculptures, including a large Poseidon, were smashed. It was a massive amount of damage. By the year 1800, less than half of the original art remained; the Parthenon was an archeological ruin. Western travelers and collectors of all types made off with bits, pillaged to ‘save and acquire’ the art. In 1801 a British-Scottish nobleman named Thomas Bruce, the Seventh Earl of Elgin, stripped the Parthenon of many of its sculptures and took them back to England. Controversy over their acquisition by the British Museum continues to this day. Elgin was well-educated and earned much regard for his military career, becoming a lieutenant-colonel at the age of 29, and commanding his own regiment. During this period, he also established a diplomatic reputation and was a special envoy in Vienna and Brussels, finally becoming the Minister Plenipotentiary—a diplomatic agent especially invested with full power to transact business on behalf of his country—to the Court of Prussia. After this commission, he returned to Scotland and had built a country mansion at Broomhall. Between his architect and himself, they were great lovers of Greek sculpture and in 1799, when Lord Elgin was called upon again to act as a diplomatic ambassador to the Ottoman sultan Selim III, he was urged to acquire drawings of the great Greek monuments. Elgin hired a team of artists just for this purpose. While there were strict restrictions on viewing the ancient works of art, Lord Elgin managed to wrangle authorization from the sultan himself. Elgin read this as being able to survey and remove whatever pieces interested him. He set about dismantling a major frieze, capitals, and metopes—highly adorned spacers. The collection numbered about two hundred boxes and was transported to England in 1801. While Elgin may have meant to donate the collection, at the time he was very ill and suffered great financial problems. The sculptures lingered until he found a buyer in the British Government, while the House of Commands determined the price. The Elgin collection is now held at the British Museum. Much controversy exists about whether the collection should be given back to Greece as successive Greek governments have petitioned for their return since 1832. Curlee Lynn. Parthenon. New York: Atheneum Books For Young Readers, 2004. Book. Nova: WGBH. Secrets of the Parthenon. The Solow Art and Architecture Foundation, 2008. 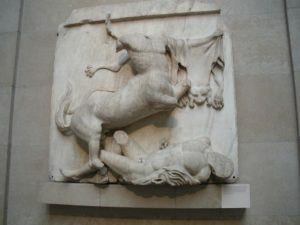 “8 facts about the Elgin Marbles"
BBC. “Lord Elgin—Saviour or Vandal?" Pearson, Christopher E. 1000 Monuments of Genius. New York: Parkstone Press International, 2009. Book.